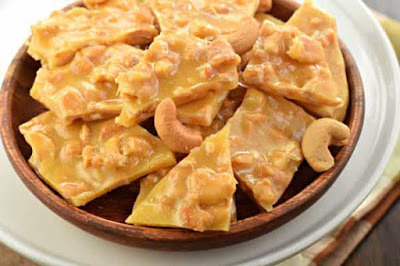 Lisa Creative Life: Cashew Brittle - National Chase w Day ! Cashew Brittle - National Chase w Day ! In small bowl, mix baking soda, 1 teaspoon water and the vanilla; set aside. In 3-quart saucepan, mix sugar, 1 cup water and the corn syrup. Cook over medium heat about 25 minutes, stirring occasionally, to 240°F on candy thermometer or until small amount of mixture dropped into cup of very cold water forms a soft ball that flattens when removed from water. Stir in butter and cashews . Cook about 13 minutes-until hard boil stage . Remove from heat and stir in baking soda .Pour onto buttered Cookie sheets -and Let Cool . Then break into pieces.